Would you like to save your hard earned cash on a night out at Stoli’s? 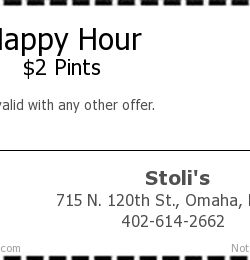 Then why not put this Stoli’s Happy Hour Pint Coupon to use and save now! With this Printable Stoli’s Happy Hour Pint Coupon you can receive a discount to $2 for pints! Make your cash go that little bit further and print off this free coupon!